THE FLATS – Matt Kuchar ties for 19th at the Sentry Tournament of Champions in Hawai’i … He joins first full field event this weekend along with three other former Yellow Jackets … This and more in the Georgia Tech #ProJackets Golf Report. The PGA Tour remains in Hawai’i this week, the Sony Open at Wai’alie Country Club in Honolulu, and resurgent Matt Kuchar hops from Maui to Oahu to join Stewart Cink, rookie Seth Reeves and fourth-year Tour member Ollie Schniederjans for the first full-field event of the 2019 calendar year. Kuchar tied for 19th last weekend at the Sentry Tournament of Champions, which brought together all the calendar 2018 tournament champions, with a 6-under-par score of 286 at Kapalua. Cink, who ranks 113th in Fed Ex Cup points following the fall schedule, is playing his first official event since the RSM Classic in mid-November in Sea Island, Ga. 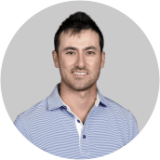 Likewise for Reeves, a Tour rookie who made all five cuts in the fall and tied for seventh at the Sanderson Farms Championship, and Schniederjans, who made three of five cuts in the fall. ALSO: With the PGA Tour two events into its calendar 2019 schedule, the Web.com Tour and the PGA Tour Champions both get underway next week. Paul Haley and Vincent Whaley, based on their 2018 qualifying school performances, are guaranteed eight starts as rookies on the Web.com Tour, which begins Monday with the first of two events scheduled in the Bahamas. Larry Mize, who finished 65th in the Schwab Cup points standings in 2018, is set to begin his 12th season on the Champions Tour in the Mitsubishi Electric Championship on the Big Island of Hawai’i.